BIRKENSTOCK collaborates with Kirna Zabête in the Hamptons. The store’s founder, Beth Buccini celebrates her love for the heritage brand with a limited edition Arizona sandal. "Beth Buccini reimagined the iconic Arizona sandal in her all-time favorite colors: luminous fuchsia and lollipop-red, the signature colors of Buccini’s concept store Kirna Zabête." 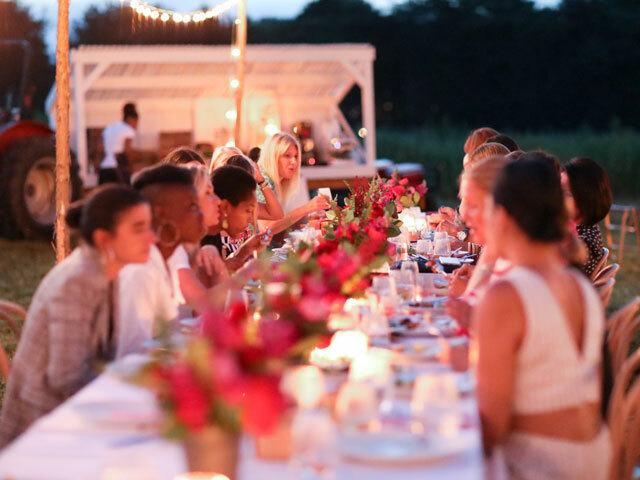 Red and pink set the tone of the evening from the cocktails to the host’s dress, to the shoes and the sunset, during a bucolic dinner at Bhumi Farms East Hampton co-hosted by BIRKENSTOCK, Beth Buccini, and fashion blogger Tamu McPherson. Celebrating the launch of the latest BIRKENSTOCK collaboration were Elle.com Fashion Editor Nikki Ogunnaik, Harper’s Bazaar US Style Director Joanna Hillman, filmmaker Penelope Lawson, and television host Alina Cho. As a lifelong fan of the brand, Beth Buccini reimagined the iconic Arizona sandal in her all-time favorite colors: luminous fuchsia and lollipop-red, the signature colors of Buccini’s concept store Kirna Zabête. The limited edition style is available online and in all Kirna Zabête stores from August 10th onwards. Guests dined to the live tunes of Montauk based singer songwriter Christiana Eva, and departed late at night with a beach kit curated by the hostess herself, with all the things you need for an unforgettable day at the beach: a woven Poolside tote filled with a beach towel in Kirna Zabête-colors, and a red BIRKENSTOCK EVA Madrid sandal. The laid-back atmosphere was the perfect setting to observe Buccini’s signature, super-feminine styling of BIRKENSTOCK’s Arizona sandal: airy, mid-length summer dresses in every imaginable color and pattern were omnipresent. Her own first pair of “Birks”, as she playfully calls them, go back to her teenage years. Eschewing black she decided for a more daring model in leopard print. A gold version spotted on the streets of Paris followed and over the years she has amassed a collection that she shares with her teenage daughters. After 18 years in the business the entrepreneur still thinks the best part of her job is to observe all those amazing women who shop at her stores. “Leaving happy about the fact that they just found a new piece that makes them feel beautiful.” We are certain that with this collaboration many more happy customers will follow.